In the game, you'll get Wolfgang. But does he belong? 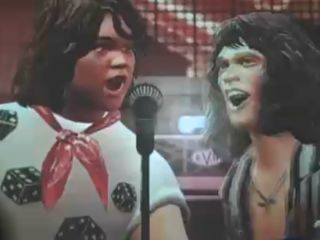 When we got our first glimpse of the trailer for Guitar Hero: Van Halen, unveiled last week at E3, we noticed that bassist Michael Anthony and singer Sammy Hagar weren't featured. And now it has been confirmed that neither will be in the upcoming game. At all. According to a rep from Activision/RedOctane, only David Lee Roth and Wolfgang Van Halen will appear in Guitar Hero: Van Halen, alongside Eddie and Alex Van Halen. Says IGN of the game, "You'll start out seeing the modern Van Halen, but eventually unlock the classic images of the band with huge hair and tight pants." Could band bitterness be behind the snubs? The image of young Wolfgang playing with the vintage-era Van Halen does look a tad weird. Perhaps this has something to do with the ongoing bitterness between Eddie Van Halen and members Michael Anthony and Sammy Hagar. Last week, Eddie Van Halen told Rolling Stone that Anthony "quit" Van Halen. But in an exclusive interview with MusicRadar, Anthony disputed Van Halen's assertions, saying, "I never quit Van Halen. It never happened."